High levels of lipids in the blood can contribute to a buildup of plaque in the inside walls of the blood vessels. 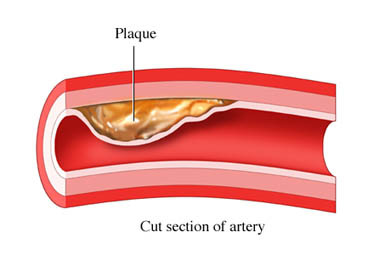 This build up causes a thickening and hardening of the blood vessel walls known as atherosclerosis . The damaged blood vessels make it difficult for blood to flow freely and in some cases can cause a blockage of blood flow. If the blockage occurs in the heart or brain it can lead to a heart attack or stroke . What are the risk factors for lipid disorders?What are the symptoms of lipid disorders?How are lipid disorders diagnosed?What are the treatments for lipid disorders?Are there screening tests for lipid disorders?How can I reduce my risk of lipid disorders?What questions should I ask my doctor?What is it like to live with lipid disorders?Where can I get more information about lipid disorders? About cholesterol. American Heart Association website. Available at: http://www.heart.org/HEARTORG/Conditions/Cholesterol/AboutCholesterol/About-Cholesterol%5FUCM%5F001220%5FArticle.jsp#.VxfkDk2FMdU. Updated August 10, 2016. Accessed March 13, 2017. American College of Cardiology/American Heart Association. 2013 ACC/AHA Guideline on the Treatment of Blood Cholesterol to Reduce Atherosclerotic Cardiovascular Risk in Adults. J Am Coll Cardiol. 2013: early online. Available at: http://circ.ahajournals.org/content/early/2013/11/11/01.cir.0000437738.63853.7a.full.pdf. Accessed March 13, 2017. Hypercholesterolemia. EBSCO DynaMed Plus website. Available at: https://www.dynamed.com/topics/dmp~AN~T114250/Hypercholesterolemia. Updated December 19, 2017. Accessed March 13, 2017. Hypertriglyceridemia. EBSCO DynaMed Plus website. Available at: https://www.dynamed.com/topics/dmp~AN~T115419/Hypertriglyceridemia. Updated February 2, 2017. Accessed March 13, 2017. What is cholesterol? National Heart, Lung, and Blood Institute website. Available at: http://www.nhlbi.nih.gov/health/health-topics/topics/hbc. Accessed March 13, 2017.